Saxony is a five province country in the north-central area of Germany. It borders Brandenburg, Anhalt, Bohemia, Wurzburg, Hesse, and Brunswick. It begins the campaign as one of the electors of the Holy Roman Empire. As a country with Saxon primary culture Saxony is able to form Prussia. The player should not form Prussia if he/she wishes to achieve the Meissner Porcelain achievement. Bach was a composer of the Baroque era and the most celebrated member of a large family of northern German musicians. Although he was admired by his contemporaries primarily as an outstanding harpsichordist, organist and expert on organ building, Bach is now generally regarded as one of the greatest composers of all time. The year is between 1700 and 1750. 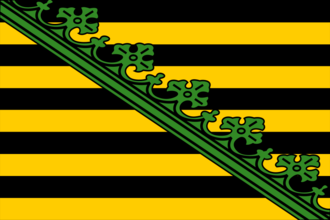 Saxony begins the game in 1444 as an elector of the Holy Roman Empire. It is a challenging nation to play, with the potential to form Prussia, Germany or become leader of a united Holy Roman Empire. Since it finds itself in a central location in the HRE, Saxony can expand easily by picking off smaller nations. To do that, however, it is important that the player ally with Austria at the very start of the game. Having the Emperor as an ally will ensure that the Emperor doesn't demand provinces that you conquer inside the HRE. After that, the player can use diplomats to constantly build spy network and then fabricate claims on and then invade Anhalt, Wurzburg, Brunswick, Magdeburg, Hesse, and even Bohemia and Brandenburg if possible. Another way for Saxony to greatly increase in size is by marrying into Burgundy and hoping for the Burgundian Inheritance to hit. The provinces of the Low Countries are rich and provide lots of tax income. By placing a merchant in the English channel trade node, Saxony can generate larger monthly incomes, allowing the player to hire better advisors and therefore accumulate more monarch points. The boost to manpower from these provinces also enable the player to build larger armies to take down larger alliances. The downsides to this strategy is that it creates a direct border with France. And if France decides to rival Saxony, then those lands would become plum targets right for the picking. A good way to prevent this is by rivaling England immediately after the Burgundian Inheritance and marrying into France. With some luck, the player will have an alliance comprising of Austria and France, giving the player the option to attack larger countries like Poland without fear. Such a strategy works especially well if the player aims to become the Emperor. To do that, it is essential to ally with three other electors in order to therefore guarantee four votes out of seven (since Saxony starts as an elector itself). The best candidates for such an alliance would be Cologne, Mainz, and Trier, though Brandenburg can be a good ally too. As soon as the Austrian Emperor dies, Saxony will become the new Emperor. This will give greater freedom for the player to conquer provinces within the HRE. The danger, however, of this route is navigating through the Reformation. If the player can manage to win the League Wars as the Emperor, Saxony's dominance can be consolidated, and it can expand south into Italy and east into Poland. If the player wants to form Prussia and/or Germany, the best option is to expand towards Brandenburg and then the Teutonic Order (or what remains of it). Since the latter is outside the Empire, grabbing the Prussian provinces provides a good boost of power. However, there are both pros and cons to reforming into Prussia. Saxony has excellent ideas and traditions focused heavily on diplomacy while Prussia's traditions are purely military. The formation of Prussia requires the player to be either Protestant or Reformed. Switching religions requires some planning beforehand, otherwise the process could take nearly 50 years to complete. In order to aid the quick spread of institutions, the player must invest surplus monarch points into developing the Saxon capital to 20 development, and other provinces to a minimum of 10 development. If the player wishes to build Saxony into a land power, there is no rush to invest in diplomatic technology, since it mainly improves ships and trade. Instead, the diplomatic points can be used to grab Diplomatic and Influence ideas. These two idea groups provide a lot of bonuses that will allow for more nimble diplomatic gameplay. The increase in diplomatic reputation is highly useful, especially if Saxony is the Emperor. Increase in diplomatic relations allows the player to have more vassals at the same time. Military ideas are also a decent since the player usually will have leftover military power. If the player is considering switching religions, taking the Religious national idea second can quickly convert Saxon lands. If religious ideas are chosen, only go four ideas deep since the rest of the religious tree is not worth it. However you can achieve +3 tolerance of heretics therefore 100% religious unity with Saxon ideas, full Legitimacy and Declaration of Indulgence. This page was last edited on 28 January 2019, at 07:36.